So this the last (perhaps) continuation of the posts getting the source URL of the featured image and using TimThumb with WordPress MultiSite. As the title says, today we are going to discuss how to automatically fetch the URL of the first image for any WordPress posts or pages and then we shall also see how to pass it to timthumb etc for creating thumbnails. This becomes useful, when your theme/plugin users are not using the featured image thingy of WordPress. In that scenario, what we can do is, search the post content for the any instance of image and return the first found image SRC. In case no images were found, we can also return some default image if necessary. So, let us see what we can do. The concept remains the same as our previous post on getting the image SRC of featured image. We search the post content using preg_match. If any instance is found we return the src. As you can see, it uses the itg_get_the_post_thumbnail_url function internally. Have a look at here for more information. You can even pass the return image to TimThumb using our TimThumb compatibility function for dynamic resizing. That will be all. Hope it helps you out for your code. If you have any question, then do ask. In your theme’s functions.php file put the functions. Now, where you need the image call the function. It can be the index.php or archive.php where you would like to show images with excerpt etc. I’m a bit confused. I don’t use Multisite, I just have one install of WordPress and I use Timthumb as well, but I would like for the image to set automatically upon uploading rather than me having to assign the image URL in Custom Fields. This can save me a lot of time since I just started using Timthumb on my Index page and having to go through now to set the URL for the image on all posts is an issue. How can I make this happen? You can use the same function buddy, and if your theme supports, then you can use the featured image function. how to make this work with a gallery in the post? I want to modify posts that don’t have a featured image, and add one. I’ve found that the all images are referenced in the posts table, and the featured image appears in postmeta, with a meta_key of ‘_thumbnail_id’. How would I go about modifying your work here in order to add the first image within a post to the postmeta table, so that it’s referred to as the featured image in the good old fashioned way? Update: I figured it out myself. 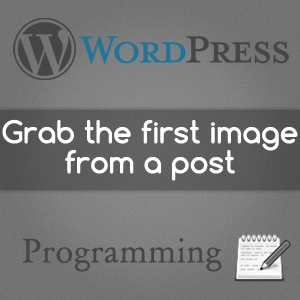 This works only under the assumption that your image was generated in the post automatically by WordPress, and thus has a class of “wp-image-0000”, where the number is the ID of the image in the ‘posts’ table. I’d be happy for your opinion on this.